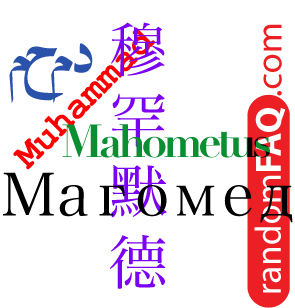 In its many forms, Muhammad has toped the charts as the most common first and last name in the entire world. There is ongoing debate as to weather the Muslim profit Muhammad was the first person to have the name. In translation the name means something to the tune of the Praiseworthy. Although the research says otherwise, many Christians debate that in all of its many forms, the name John must be most popular. What they seem to have missed are these facts: that the name is undoubtedly the most common name of the Middle East, that from the Middle East it has spread like wild fire to Muslims and others in the Far East, that the name has surpassed George in the United Kingdom, that Turkey is a Muslim country in the EU, and that people with influence in the United States like Muhammad Ali have helped in the rampant spread of the name in the New World.